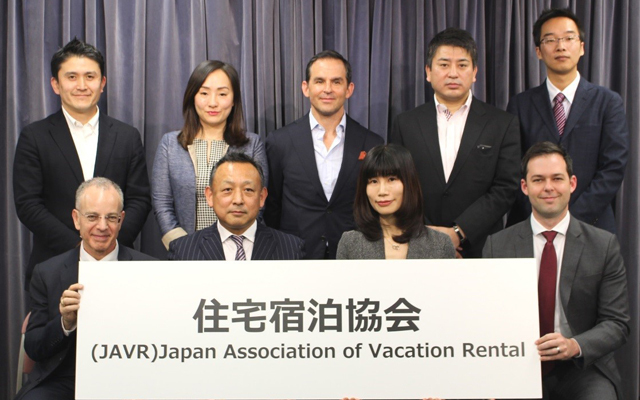 The Japan Association of Vacation Rental (JAVR) – founded by nine major vacation rental and travel agencies including Airbnb – will soon be launched, with the founding committee working to establish it as a general incorporated association in early 2019. Its founding committee is made up of Agoda International Japan, Airbnb, Booking.com Japan, Ctrip International Travel Japan, HomeAway, Hyakusenrenma, Space Market, Tujia Japan and Rakuten Lifull Stay. The nine founding companies will go on to be on the board of directors, with Yasuhiro Kamiyama, CEO of Hyakusenrenma, and Natsuko Kimura, Japan country manager of HomeAway as the association’s first joint representative directors. The association will promote Japanese vacation rentals to inbound travellers to Japan as well as to the domestic market. In collaboration with Japan Tourism Agency, the newly established JAVR will aim to contribute to the development of the tourism industry in Japan and grow vacation rental businesses such as vacation rental, ryokan business utilising residential facilities, vacation rental in the national strategy zone and event vacation rental. To achieve this, the Vacation Rental Association will work to ensure smooth operation of related projects and “improve cognition” and the institutional environment. Since May 2018, Japan Tourism Agency has shown support for the founding committee of the association. Before the preparation meeting to confirm the establishment of the association on December 11, discussions with overseas and domestic major vacation rental travel agencies had already been ongoing for over half a year.